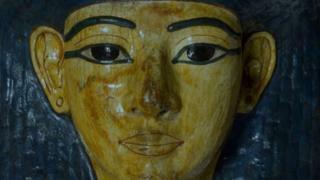 Artefacts celebrating ancient Egyptian "coffin art" have been showcased in a Cambridgeshire pub. The collection, from Cambridge's Fitzwilliam Museum, is part of a "pop-up" event bringing the Valley of the Kings to the flatlands of the Fens. Locations in Wisbech, including The Wheatsheaf Inn - are exhibiting 3,000-year-old coffin fragments and tools. Egyptologist Melanie Pitkin said the aim was to share "with an audience that might not otherwise come across it". The exhibition - known as the 'Pop-Up' Egyptian Coffins Project - will run across Wisbech until the end of June. Among the items on show are a varnished wooden mask and clenched fist - fashioned from sycamore fig - which would have adorned the lid of an Egyptian coffin. The exhibition includes artwork and tools used by ancient coffin makers, as well as CT scans taken as part of the Fitzwilliam Museum's intensive research into ancient coffin-making. "People are happy to see that we've thought about their community by bringing our research to them," said Dr Pitkin. "They come in here for their eggs and bacon and chips and beer, and they can actually speak to a real Egyptologist, which is quite exciting." Egyptian antiquities associate curator Helen Strudwick said the collection offered "a whole new perspective on Egyptology". "It's about people rather than weird gods that sometimes appear on ancient Egyptian coffins," she said. "Although we will cover the usual hieroglyphs and funerary beliefs of ancient Egyptians, what we're looking at is the people who made the coffins, the construction of them and the people for whom they were made."